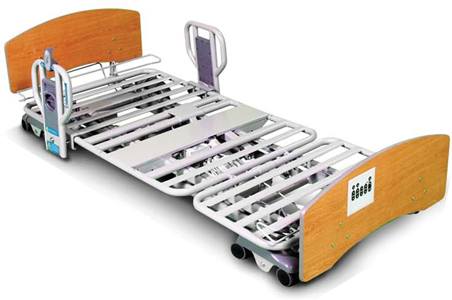 Expands into a 42" 5001b Capacity Bariatric Bed ! Everyday presents a new challenge in caring for residents and at a time when safe working environments, quality of care, and cost consciousness are at a premium. Your equipment needs to rise to the occasion and that's where we come in! 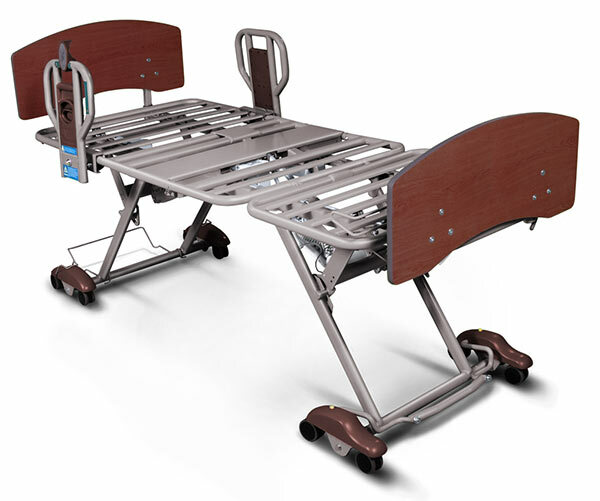 The Low Bed 900 Prime bed can handle your non-traditional bariatric patient; a person who needs a little more elbow room for comfort and dignity. An additional benefit is a more workable surface for repositioning and care by staff and faculty. Boasting a 500 lb. 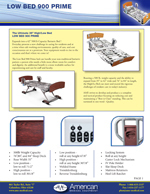 weight capacity and the ability to expand from 35" to 42" wide and 76" to 84" in length, the High/Lo Bed can meet and exceed the rigorous challenges of resident care in today's industry. AME strives to develop and produce a a complete and tactical product focusing on reducing cost and maintaining a "Best in Class" standing. This can be surmised in one word - Quality. If the package is standing, slowly lower to the floor. It may be necessary for two or more people to help in lowering the bed. Cut black strapping around box; remove box ends and plastic surrounding bed frame. Cut zip ties to remove wall guard at the head of the bed. Cut the zip ties to remove mattress retainers on each side of the bed. Remove any remaining zip ties or foam left on bed frame. Locate power cord and plug into grounded 110Ͳ120V outlet. Raise the bed frame and check to make sure everything is plugged into the control box and no wires are loose. 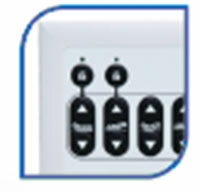 If wires are not in control box, match up by the color coded system. 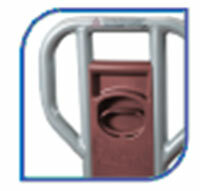 Mattress Retainer is designed to keep the mattress in place on the sleep surface. Determine what the length of bed you will need to use. Please read important information on Mattress Retainer and follow instructions on installation. 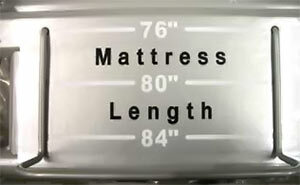 Use the 76”, 80” and 84” guide on the head and foot section to place your mattress retainer in the correct spot. If you are using a 76” bed frame there is no need to move the mattress retainers at the head and foot section. If you are using a 80” bed frame you will need to move the head and foot section mattresses retainers to the 80” slots which is the middle position. If you are using an 84” bed frame you will need to move the head and foot section mattress retainers to the 84” slots which are the last slots closest to the head and foot boards. The remaining mattress retainers on the perimeter of the sleep deck should be moved in the upward position. Place mattress on mattress support deck. The mattress should now be snug against all of the mattress retainers. Replace mattress, making sure mattress fills length between Mattress Retainer stops. Also, make sure the mattress does not compress below 1.5” under patient/resident weight. 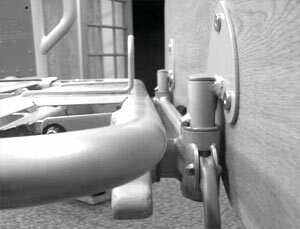 NOTE: 3/16” Hex key required for initial mounting of headboard and footboard support assemblies. This tool is also required for bed length adjustment. 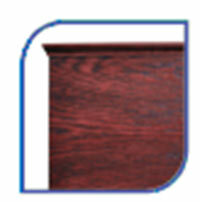 Insert headboard or footboard support assembly, whichever is appropriate for the end of the bed you are working on. There are mounting positions for 3 different mattress lengths, 76”, 80” and 84”. Choose the one appropriate for your mattress. Length 76" / 80" / 84"
Overall Length 85 1/4" / 89 1/4" / 93 1/4"
Overall width with 2 extension 42"
Length of mattress deck 78"
Mattress deck height - low position 7 1/2 "
Mattress deck height - high position 30 1/8"
Head deck angle range (x) 0" to 7"
Thigh deck angle range (Y) 0" TO 32"
Foot deck angle range (z) 0 to 11"
Knee to foot deck angle (k) 0" to 43"
Weight of Bed 202 lbs.